Me (said with a sob in my voice): Banana who? Me: (as I bang my head off of a hard surface)Who’s there for petes sake!? Child (giggling with extreme maniacal glee)Orange you glad I didn’t say Banana!? In 25 years of motherhood, I have heard that knock knock joke approximately 5, 362 times. Add the 10,422 times I have heard Elephant jokes (ok, so I actually like those and routinely annoy people with them myself), fart jokes, pee jokes and jokes that make no sense whatsoever (Mommy, why did the…ummmm…the purple boy run across the street? Me- Why? Child- Because he wanted to eat a cookie! HAHAHAHAHA!!! Did you like that one momma!?) and it is a wonder I have any shred of sanity left. When my son Jordan, who at sixteen has the childlike heart of an eight year old due to various mental disabilities he deals with, told me that joke for the 5,362nd time today, I laughed and groaned as my job description of mom demands I do, then I went back to thinking about todays post. I knew I wanted to make something sweet; surprise surprise, right? But I wasn’t sure what. Then the orange knock knock joke popped into my head at the same time as a serious chocolate craving hit me upside the head. So this is what I came up with for today. I hope you enjoy them. We did. 🙂 These are a moist dessert like muffin (not that that will stop me from eating them for breakfast!) bursting with orange flavor and dark chocolate chips. Beat sugar and butter in a large bowl at medium high speed until light and fluffy. Add in the yogurt, marmalade, orange extract and juice. Beat until thoroughly blended. Beat in eggs, Again, beat until well blended. In a small bowl, mix together your flour, baking powder and salt. Pour it into the bowl of wet ingredients and mix with a large spoon (if you use your beater, you take the chance of 1) wearing a bowl full of flour and 2) over mixing) JUST until everything is combined. Don’t over mix or you’ll end up with tough muffins. Mix in the chocolate chip; again, just until mixed. Bake in the 375 degree oven until golden brown. Mine took 22 minutes. This entry was posted in Desserts, Quick Breads, Sweet Baked Goods and tagged chocolate, muffins, orange, quick breads by Janet. Bookmark the permalink. Chocolate / Cinnamon isn’t bad either…..or Chocolate / Cherry….. I love dark chocolate and when combined with orange, it’s just incredible. Definitely going to make these! Cool! Hope you like them Alida! orange is the next fruit from raspberry that i’d like to pair with dark chocolates and you just got that in your muffins 🙂 they look delicious! A dessert-like muffin for breakfast? I’m in! Muffins look amazing – but the intro….THAT was funny! I hope you didn’t bang your head on the counter too hard! Believe it or not, my husband told me that joke about a month ago – except he did the knock-knock part about 9 times….he wanted to see how long it would take me to get frustrated (after the 3rd time)….What a HOOT! Dark Chocolate and Orange is a match made in heaven! I bet those muffins were so very very good! I count my blessing when I think of my mother and what she put up, I’m sure your little ones will feel the same way as they get older and have their own. Haha that is too funny! 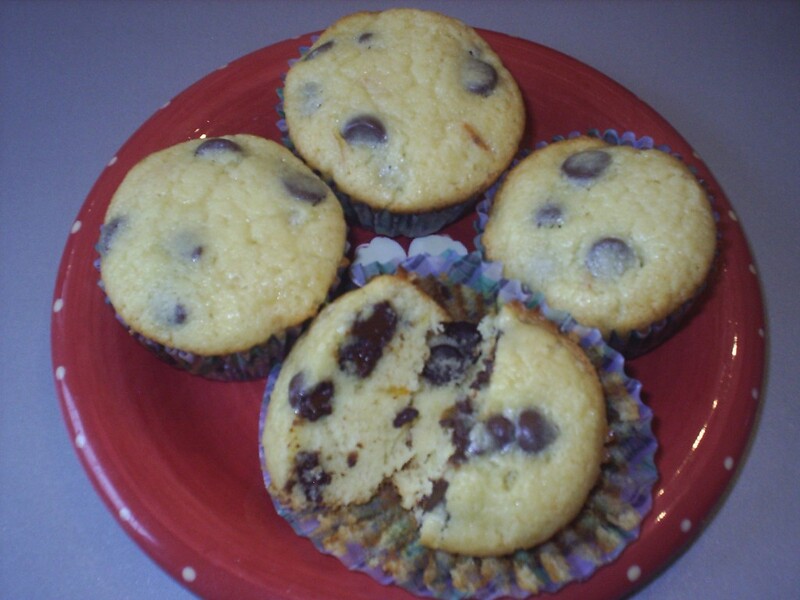 These muffins have a great combo of flavor going on they look yummy! 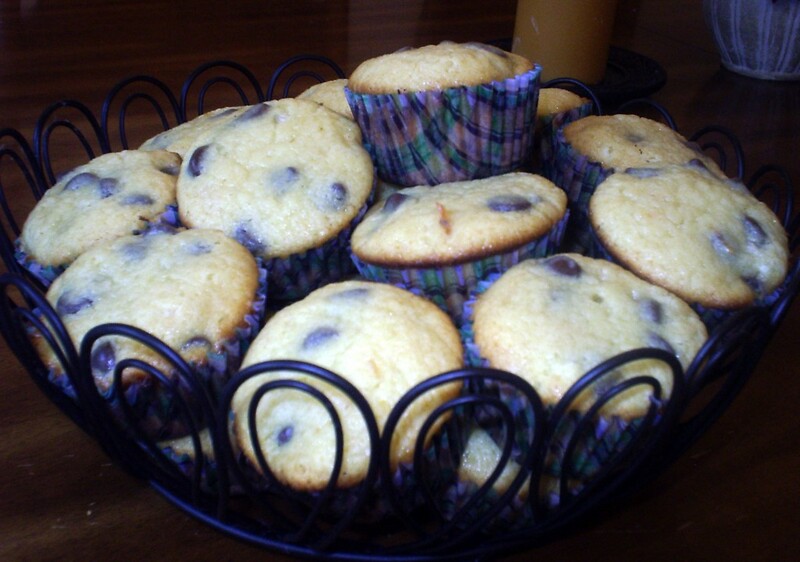 Love chocolate chip muffins, how fun!! The orange sounds like a great combination too. It turned out quite nicely. Thanks Lindsey! These look very yummy and if it wasn’t summer you would have inspired me to make muffins. Cute post and love the orange chocolate combo! Thanks! And one of my faves too! That’s one of our favorite jokes too! And although I think you’ve heard it about 22 times more than I have, I never tire of it. Love the muffins! Orange Marmalade as well as the orange yogurt make it a winner. I never really think of orange and chocolate as a combination – but these muffins sound absolutely fantastic – and lucky for me, I have everything on hand! Love the orange and dark chocolate! i will have to give them a try. I love the way you went all out with the orange flavor, the more the merrier. My granddaughter (the pint sized diva), loves to tell us jokes at the dinner table and most of them make absoloutely no sense. She doesn’t expect us to laugh anymore, just listen. Kids, I tell ya!! !